See one of the most dramatic natural rock formations in the world! Take a guided, small-group tour of the conglomerate rock domes of Kata Tjuta, one of Australia’s most iconic natural features! Travel to the famous Walpa Gorge and learn the history and myths surrounding this spiritual place! Journey across one of the most strikingly beautiful landscapes in the world. You’ll travel to the world-famous Uluru-Kata Tjuta National Park, home to some of Australia’s most unique flora and fauna. As your guide drives you across this breathtaking desert landscape, keep an eye out for Australian animals such as kangaroos and Perentie lizards. 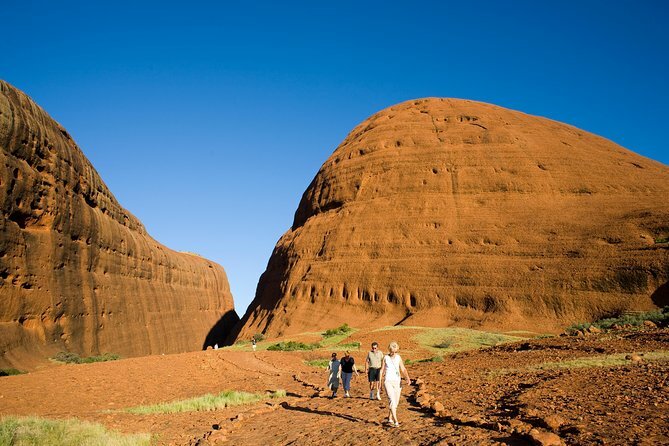 Upon arrival, you will walk through Walpa Gorge as your guide explains the history and composition of the 36 mighty Kata Tjuta conglomerate rock domes. Take time to listen to the wind (Walpa) far above and view the scale of the rock walls that surround you. The spirituality of this amazing location embraces everyone who ventures here. Following your exploration of the Kata Tjuta conglomerate rock domes, your guide will take you back to your Ayers Rock Resort hotel in the late afternoon. We were picked up on time. Our guide Gareth was very good and ensured that we all had water us. It was an extremely hot day. Kata Tjuta was fantastic as we approached. We started the walk, but the heat combined with the uneven surface got the better of us and we cut the tour short and returned to the minibus area and shade. Gareth was very supportive and made sure 'us oldies' were OK. Well worth seeing though. What an incredible afternoon! Our driver Bruce was very informative and helpful. It was extremely hot and the going was quite difficult for me as I am 6 months post a knee replacement but persevered to the end and Bruce kept checking to see I was OK. Learning about the formation of Kata Tjuta and its significance to the aboriginal people was very fulfilling even to my husband and I who were the only Aussies in the group. The fresh cold water and iced facecloths to help us cool down at the end of the walk were inspirational. Would highly recommend this tour for the insight it brings. Being amongst the grandeur of such a feature makes you feel very insignificant indeed. Excellent tour. Our guide Brett was attentive and made sure we all had enough water. Because of the heat the walk was shorter than usual but it was good. If we had been on our own we would have probably underestimated the heat and would have suffered from exhaustion. Group size was good. Our small group tour to Kata Tjuta began on November 13 with our pick-up at the Desert Garden Hotel at 14:30 by SEIT Outback Australia. It took nearly 45 minutes to travel by small bus to Kata Tjuta where the group hiked into a mountainous area with explanations of some of the geology and flora provided on the way. It was not a strenuous walk but hot for which water was provided. There were also explanations of some of the Anunu beliefs involving the Kata Tjuta. It was a well run tour and the guide was lovely. Good tour. Because of the time of year we visited February and it being an afternoon tour, we could only hike in part way. The guide was friendly and knowledgeable. If we had to do it again, we'd go in the morning so we could do the full hike. Really good tour but I would not do it again in the afternoon heat. Our guide was extremely helpful in overcoming the heat factor with water spray, iced towels and electrolyte drink. Very good. but no refreshments offered. Guide nice and relaxed with lots of info. Walk up to the platform quite risky with lots of rocks, etc, but this was not the guide's fault. Views a little disappointing, expected more. Tour was cut short as the driver/guide couldn't find persons supposed to be booked on this tour. That wasn't her fault but time taken driving back to the resort searching for these people who apparently never really existed.